August is normally a really busy month for the blog, with a couple of shows that I try to not miss. The first is Gen Con, and the second is the Indiana Toy and Comic Expo, or ITCE. ITCE started here in Indianapolis, before moving down to Bloomington after a couple of years. Even if I haven’t written about it (ITCE Category Link), I have tried to make it to the show every year. While it’s not huge, nor is it a full weekend, it’s just a perfect one-day shindig, filled with vendors, cosplayers, and a lot of friends. This year, the show was held on Sunday, August 26th. Lizz and I headed down on Saturday, to do some shop visits and spend time with friends down there, before setting up early Sunday morning at the show. This year, instead of attending to buy things and say hi to people, we were invited down to be part of the inaugural “Podcast Row”, along with The World’s Almost Finest Podcast, The NerdUp Podcast, The ITCE Podcast, the Five(ish) Fangirls Podcast. We were set up next to Rachel, one of the Five(ish) Fangirls, at the end of the row, and we fairly quickly got all of our pins and merch out, and waited for the doors to open. Lucky for us, Podcast Row was set up in the first room you entered after paying your admission fee, so we were able to see everybody coming in. There was a steady flow of people when the doors opened, and it remained pretty steady throughout the day. We had a decent flow at our tables, though you could tell that most of the people there were attending for the actual vendors, and the artists. 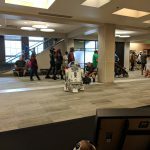 I did have fun meeting a few of my social media followers for the first time, plus talking with friends in the local Star Wars groups building groups. For a bit, I was able to step away from the table to look around the show, say hi to friends who were vending, and peek at tables. While there was some stuff I had my eye on, there was nothing that demanded I throw money at it, especially with our financial situation, so I left empty handed. However, it looked like the show filled the convention center space this year, with vendors in two rooms downstairs, as well as on the second floor of the convention center. Lizz did find some art she loved, and I encouraged her to pick that up, so we didn’t come back to Indy without completely spending money. By the end of the day, I had provided equipment for a live podcast recording (I didn’t feel up to getting on stage, myself), I sold a few items (I’m almost out of fidget spinners! ), I talked to a lot of friends, and I had a good time down in Bloomington. ITCE has already announced their show for 2019, as well! It will be pushed back a bit, due to other conventions changing their schedules around, to Sunday, October 6th. Same time, same location. I know Team Geeking will be back, in some form, in 2019, though whether it’s as guests, or paying our way, still remains to be seen. I’m fine either way! Thanks again to ITCE for having us down on Podcast Row, despite the podcast kind of falling to the wayside this year! It was appreciated, we had a good time, and we look forward to seeing everyone in 2019! I'm just a Geek who likes sharing Geeky things. 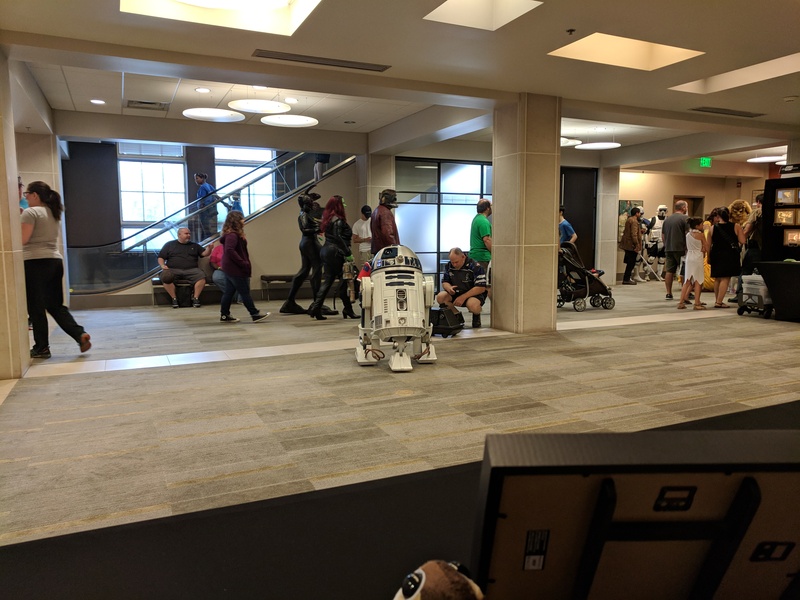 Indiana is turning into a great Geeky, Nerdy hub of awesomeness, and I like to share it with you all. I also enjoy fried mushrooms, burritos, and will always choose cake over pie.